In this blog, we will provide you with the list of high yielding topics that can help you crack FMGE, the topics that you should master from the 19 Subjects. The list has been deduced from the analysis of past exams by FMGE Toppers & Subject Experts. 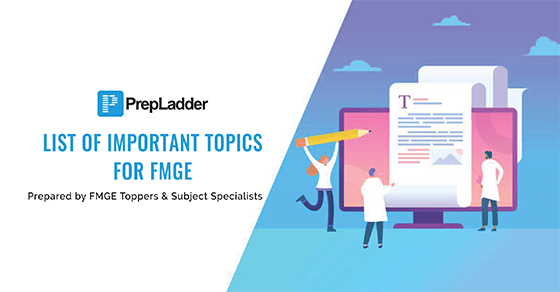 Before you proceed to download subjectwise important topics for FMGE, you must watch Dr. Gobind Rai Garg & Dr. Apurv Mehra discuss and explain the most effective way to prepare for FMGE June 2019. Let the best guides help you plan your preparation. There is no need for the candidates to go through each and every topic in all the subjects if an aspirant gains command over these topics mentioned in the above PDF. These topics have been tested by our experts after going through each and every FMGE paper. Preparing these topics will help you be more precise with the preparation focusing on the Examination point of view saving a lot of extra effort and time. And according to our research, you’ll know 80% of the exam if you are thorough with the first 50% topics of each subject. Most of you would be wondering that how come we are so sure about the topics and how did we deduce such topics. Here is a brief review of what our experts did to make the preparation job easier for the FMGE aspirants. Number of Questions in FMGE Examination is 300 MCQ’s in each session. The Examination papers over 15 years were analyzed to come to this conclusion. Each MCQ was tagged with its topic and then all the questions falling under the same topic were brought to one place. Then these topics were arranged in the decreasing order of the number MCQ’s. Keeping these conclusions in mind our experts enlisted the important weightage topics. Device a smart plan to prepare important topics to excel in the upcoming FMGE exam.